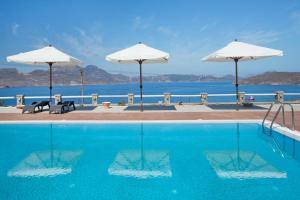 Miland suites is in a beautiful, serene location with excellent views. Highly recommended! We loved this place. The staff was wonderful. We felt so welcome! Breakfast was fantastic. Loved the view from our deck, and the pool area (which included lounge chairs in shade.) Room was very comfortable and well-appointed. Good ac, wifi, bed, bathroom. Location was perfect- 5 minute drive to the center of the harbor, but also easy to get to beaches on the south and Pollonia to the north. 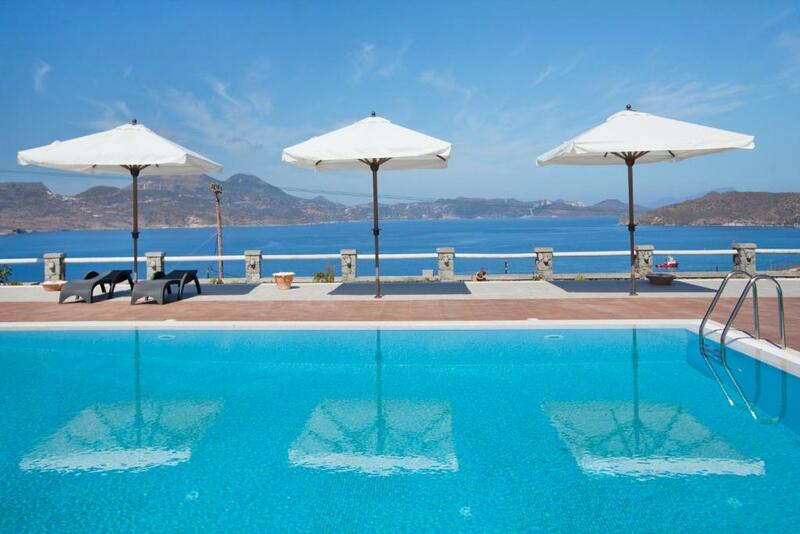 It was our favorite place in Greece, and we stayed in several outstanding places on different Islands. The staff were welcoming, helpful and friendly. The pool and grounds were pretty and well kept. The room was comfortable, clean a d roomy. The breakfast was great and had a lot of variety. This was a great place to spend the first night in Greece and the first night of our honeymoon. Nice view of the milos sea. The guest's national flag will be on the pole when you lived here. Accueil chaleureux,Anti et Anastacia s'occupent tellement bien de vous que vous n'avez pas envie de partir: L'équipe a des petites attentions quotidiennes pour ses clients: capsules, bouteilles d'eau et pâtisseries qui vous attendent tous les jours dans votre chambre. L'hôtel est idéalement placé sur une colline avec une superbe vue sur la mer! Il est idéalement placé, vous êtes à 5 min en voiture de Adamas et à 15 min de n'importe quel village de l'île. Dans la chambre, tout le confort est disponible: peignoirs, chaussons, serviettes de plage, literie excellente. Petit-déjeuner Top! Un régal et très diversifié, par rapport à d'autres hôtels (même catégorie) sur d'autres îles, c'était de loin le meilleur. Silence absolu: en effet l'hôtel se trouve au bout d'un chemin, sur une colline, donc aucun bruit. Tou était parfait. Les petits attentions à l'égard de la clientèle, du jamais vu. Des petits gateaux tous les jours à votre retour dans votre chambre fin de journée. Dès qu'on arrive à la piscine, on vient vous apporter gratuitement des boissons rafraichissantes.. Lock in a great price for Miland Suites – rated 9.5 by recent guests! 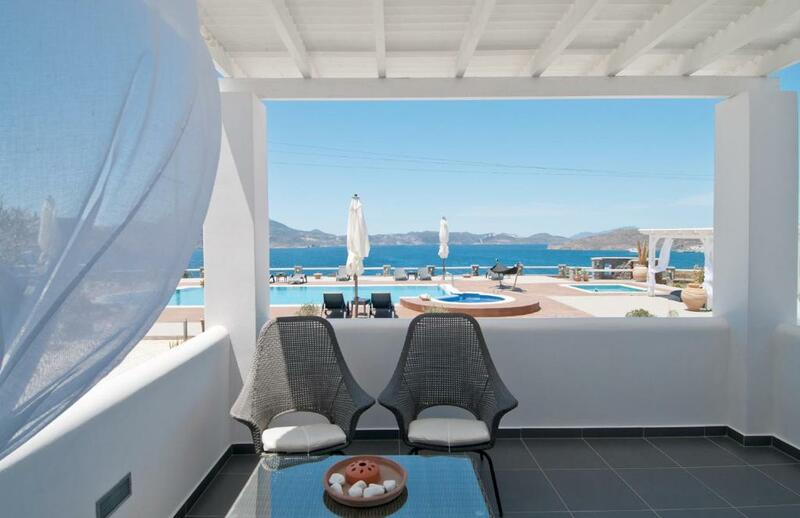 Within 0.9 mi from Papikinos Beach in Adamas, the Cycladic-style Miland Suites features a pool with hot tub, a furnished sun terrace and a sea-view snack bar. It offers uniquely decorated suites with a spacious balcony or terrace. Enjoying partial or full views over the Aegean Sea, the junior suites are fitted with well-chosen furnishings and soft colors. Each is equipped with air conditioning, a coffee machine and a flat-screen TV with satellite channels. The modern bathroom comes with a shower cabin and a hairdryer. An American-type breakfast enriched with homemade flavors and local delicacies is served daily at the dining area. Drinks and coffees can also be enjoyed by the pool. 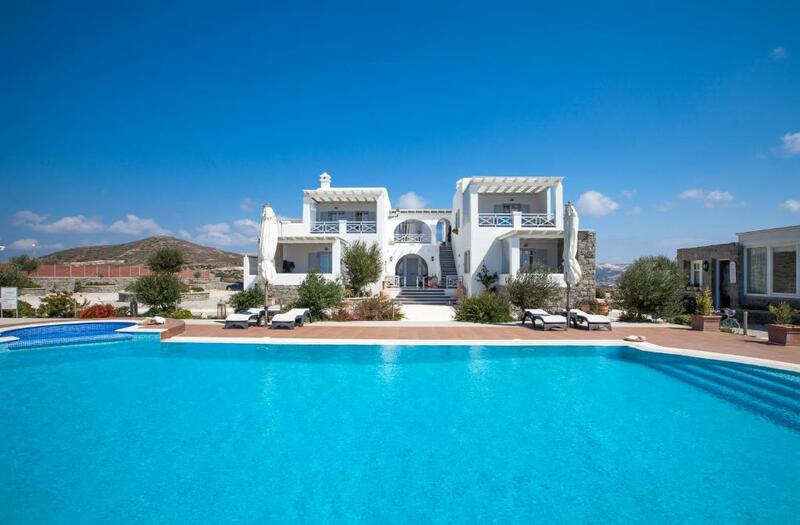 Miland Suites lies within 1.6 mi from both Adamas Port and Milos National Airport. The scenic Plaka Town is 2.5 mi away, while Achivadolimni is 3.1 mi away. Free parking is possible on site. When would you like to stay at Miland Suites? This elegantly decorated junior suite enjoys partial views over the Aegean Sea from its balcony or terrace. 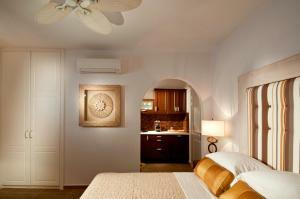 It includes air conditioning, a coffee machine and a flat-screen TV with satellite channels. The modern bathroom comes with a shower cabin and a hairdryer. 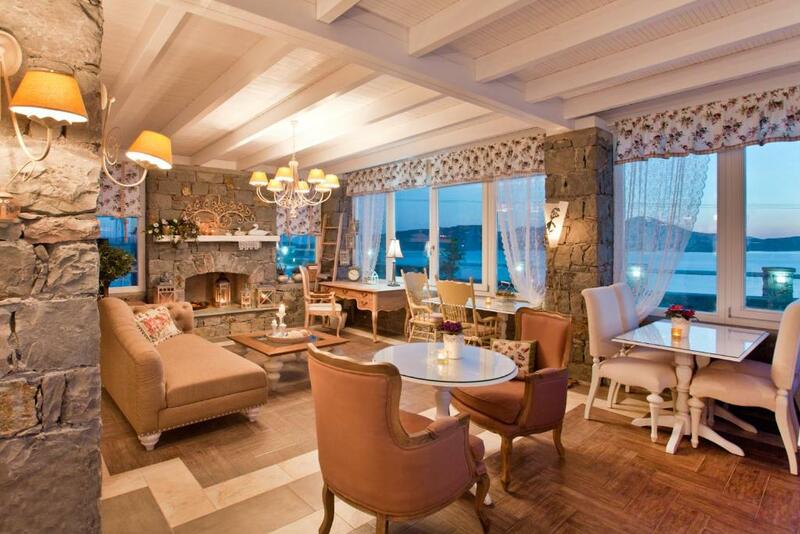 This elegantly decorated junior suite enjoys unobstructed views over the Aegean Sea from its balcony or terrace. It includes air conditioning, a coffee machine and a flat-screen TV with satellite channels. The modern bathroom comes with a shower cabin and a hairdryer. This double room has a tile/marble floor, satellite TV and sea view. 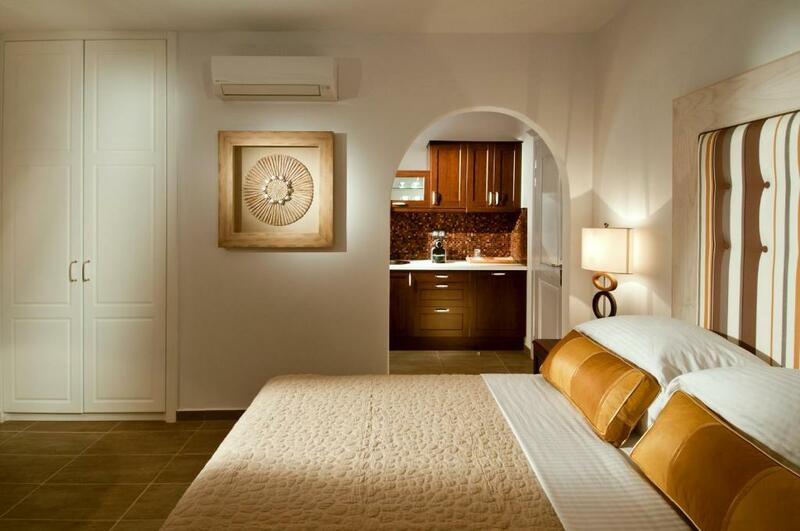 House Rules Miland Suites takes special requests – add in the next step! Miland Suites accepts these cards and reserves the right to temporarily hold an amount prior to arrival. Please inform Miland Suites of your expected arrival time in advance. You can use the Special Requests box when booking, or contact the property directly using the contact details in your confirmation. The pool water was very chilly, it would be nice if the pool ere heated so we could have enjoyed swimming more. - We missed having a restaurant on site. The hotel isolation is attractive is some ways, but without a restaurant/bar one is forced to drive out to restaurants. There is nothing within walking distance. Outstanding service!! peaceful Very quiet place!